Little research exists about gender relations and divisions among waste pickers. A collaborative project involving waste pickers in Latin America seeks to shed light on the multiple levels of discrimination that women waste pickers face and their needs. In 2012, the Latin American Waste Pickers’ Network (Red Lacre), the National Movement of Waste Pickers in Brazil (MNCR), and Women in Informal Employment: Globalizing and Organizing (WIEGO) agreed on the importance of opening up a dialogue about gender in the context of waste picking or informal recycling. 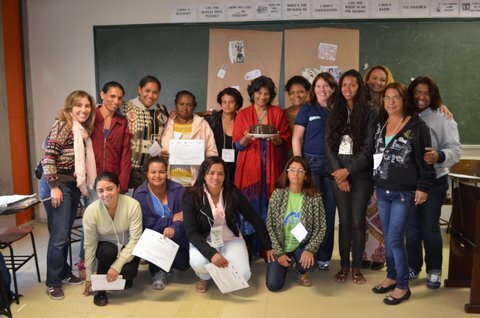 An existing relationship with the Center for Study and Research on Women (NEPEM) of the Federal University of Minas Gerais (UFMG) allowed these groups to start a pilot project in the state of Minas Gerais, Brazil. Later INSEA, an NGO, joined the project. In 2013, as a result of this participatory process, the Gender and Waste Project launched. It seeks to understand the multiple levels of discrimination that women waste pickers face in the home, in the workplace, and as leaders in their networks and movements. The project also aims to map the needs – such as professional and educational qualifications – of women waste pickers so that they can be economically and politically empowered. Dias emphasizes that the empowerment of women does not mean the exclusion of men – it means the emancipation of all people,. Discussion on the ways in which gender relations impact women’s and men’s lives – in the home and in the workplace – are imperative for awareness and change. Ângela Oliveira of INSEA says there’s been a marked increase in women’s participation in the waste pickers’ associations and cooperatives. With that comes a need to analyze the gender relations in the workplace. Oliveira said the gender workshops made possible the gathering of women waste pickers in order to initiate these discussions on little explored topics. “Our goal is that these discussions are shared with male waste pickers,” said Oliveira. This highlights the need for a long-term, participatory process of education and training on gender relations. The Gender and Waste Project, one of the first of its kind in Latin America, is approaching this challenge so that women waste pickers continue to move forward.